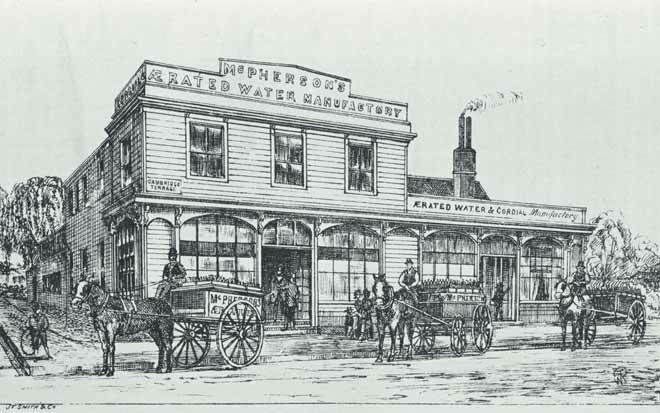 Robert McPherson, cordial and aerated-water (soft-drink) manufacturer, had built up a substantial business by 1885 when this drawing of his factory, sales premises and home was made. Located on the corner of Worcester St and Cambridge Terrace in Christchurch, the buildings probably included stables for the horses shown here in front of the building, ready to distribute dray-loads of McPherson’s products. The buildings were insured for £500 ($87,000 in 2009 terms) and the stock and equipment for £800 ($140,000). Two years later the entire premises burned to the ground, killing McPherson.